Sinusitis is a viral or bacterial infection located behind your cheek bones and forehead, these spaces are known as sinuses. They are usually free of germs, but if the mucous gets stuck in the sinuses, it may cause sinus infection. – The frontal sinuses; they are situated above the eyes, in the region between the eyebrows. – The maxillary sinuses; situated within the cheekbones, behind the nose bridge. – The ethmoid sinuses; situated in between the eyes, behind the nose bridge. – The sphenoid; situated behind the ethmoid sinuses, as well as behind the eyes. 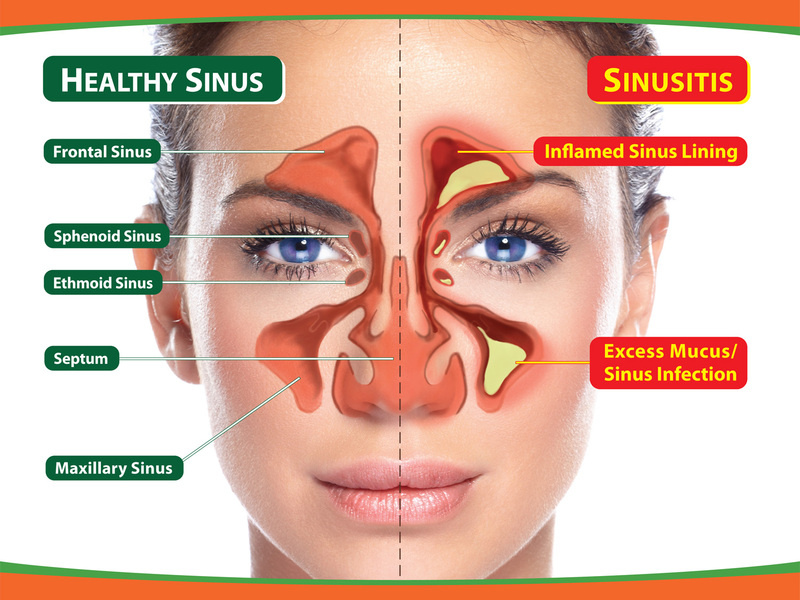 Sinuses have several functions, for example: making the incoming air warmer and helping in the formation of different sounds. If the sinuses get inflamed and infected and the condition lasts less than four weeks, it is called acute sinusitis. If acute sinusitis becomes persistent and symptoms last longer than three months it has progressed into chronic sinusitis. Sinusitis can get from a minor annoyance to a serious condition – chronic sinusitis – that could require surgery if not treated properly! A few of the symptoms you may have associated with sinusitis are stuffy nose, headache and thick, green, yellow or blood-tinged nasal secretions. Prescription drugs like decongestants or antibiotics bring relief only temporary and have unhealthy side effects. In long-term (chronic) sinusitis, sometimes the only prescribed treatment is surgery, which is usually not the most successful either. Usually it is endoscopic that means a tube (endoscope) is inserted into the nasal passages to remove small pieces of bone or tissue that block the sinuses. Surgery is recommended only if prescription medication or other therapies fail to provide the desired relief. However, there are long-term natural therapies that are able to greatly improve sinusitis and one of these is salt therapy. Risk factors in sinus infection are allergic rhinitis or nasal allergy (hay fever), nasal polyps, congenital nasal abnormalities (deviation of septum), cystic fibrosis, asthma, smoking, low immunity. Salt therapy can help with all of these respiratory diseases not only sinusitis, working on the risk factors as well. Salt therapy strengthens the respiratory immunity to all kind of pathogens, keeping you healthy and energetic. It is very easy to use salt therapy – you just breathe the salty air released from a salt machine, usually during the night sleep. Yes, it is a home therapy that offers you long-term treatment necessary in a chronic condition. It is like breathing the seashore aerosol for an entire night…over and over! The salt aerosol helps to fight bacteria, viruses or fungi; helps to reduce inflammation and the IgE levels, strengthening the respiratory immunity. Salt helps to fluidize the sticky mucus and clears the airways, promoting better blood oxygenation and better sleep. It helps you breathe better and regain your health, without any side-effects.